A Pliko Display uses Silicone Edge Graphics (SEG), which are simple to install and replace, and are machine washable. The light weight aluminum frame needs no tools, and collapses and folds up quickly and easily for set up and dismantle. 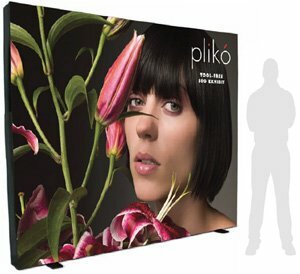 To set-up the Pliko display, you only need to unpack the frame, lay it down and straighten it out. Then install the fabric graphic by pushing the silicone bead on the edge of the graphic into the grooves in the frame. Finally, just turn the feet out. In less than 10 minutes you're ready to stand up your great looking Pliko display! A durable hard shipping case is included in the display kit. You can also get a fabric graphic panel for the back side of the frame if you'd like to use it as a double-sided display. Pliko Displays provide great looks, simple and fast setup and dismantle, to make your trade show booth space look great and your trade show work load a lot easier. Note - NEW in 2015 - the Pliko display has been upgraded, and now comes with built-in LED backlighting. The kit may be purchased with or without the unprinted back graphic, which is used as a reflector for backlighting. Kit prices include graphics, unprinted back graphic, frame with LED backlighting & shipping case. Unit with Graphic: 40 lbs. Pliko Hard Case: 20 lbs. Total ship weight: 60 lbs.